Walking a Labrador takes both time and patience. In general, walking a Labrador for one hour a day (half an hour in the morning and half an hour at night) is sufficient. However, depending on the activeness of the dog, this time duration may fluctuate. Most veterinarians recommend that regardless of how long the walk takes, most Labradors should get in at least 2 miles every day. The size of the dog matters as well, as larger dogs that have more strength should walk both longer and faster so that their energy is easier to manage throughout the day. These dogs should also walk as much as they can on a regular basis to keep up their stamina, which will be helpful when they age. The general rule is that the shorter a dog’s legs are, the less distance they are capable of walking. 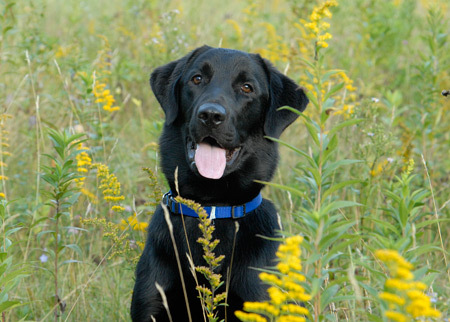 Since every Labrador is different, it is advisable to observe the dog during the exercises and see what speed, distance, and duration is suitable. Also, when starting the training, start off slowly as to not overexert the dog too much. A dog panting excessively and exhibiting tiredness is a strong indicator that it has walked enough. However, regardless of the dog’s walking regimen, the important thing is to keep him on a consistent and regular schedule.